There is great tension during a scene late in “Offside,” an Iranian film directed by the great Jafar Panahi, when the Iranian soccer team commits an offside penalty. Will this cost them the close game? Will it spoil their hopes of going to the World Cup? The “Offside” of the title is also used metaphorically. In soccer, an offside penalty occurs when offensive players race past the opposing defense in an attempt to receive a wide open pass and score a goal. You might say the offense gets too uppity. 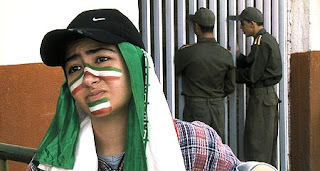 In Iran, women are forbidden to attend men’s sporting events. “Offside” focuses on a number of “uppity” female soccer fans who attempt to sneak their way into a soccer game between Iran and Bahrain, and get caught. The film centers on how they’re penalized for this act. “Offside” is a very accessible film. It’s a great place to start for anyone unfamiliar with Iranian cinema and should cultivate an appetite for seeing more when Cinema 100 brings it to town next Thursday. I’ve watched several dozen films from Iran and consider the nation’s cinema one of the most vital and beautiful in the world. Iranian cinema is also easily digested by Western audiences due to its close – but not dead-on – affinities with Hollywood genres. “Children of Heaven,” another personal favorite from Iran, tells a delicate story of two children and a pair of shoes that is connected to the Hollywood sports film during its climax. “Offside” also benefits from its resemblance to Hollywood. I’m thinking of films where a group of character types are trapped together and forced to come to terms. “12 Angry Men” and “The Big Chill” are examples. Above all though, “The Breakfast Club” comes to mind. Both films focus on a group of young people stereotypes held in detention. Both give these characters – and the audience – an opportunity to see beyond the stereotypes. Both films end with a celebratory sense of elation when the characters are released. In “Offside” though, this is all handled with more restraint. No “brat pack” theatrics, just a fine ensemble of non-actors and a lot of nuanced improvisation. “Offside” tells a simple story in three parts. The first follows one young woman’s attempt to gain entrance to the big game. Shot guerilla fashion amidst the pregame chaos, this sequence is stunningly suspenseful (the game depicted is real and is opportunistically used by Panahi in documentary-like fashion). This section is also casually funny. Everywhere the handheld camera turns, we catch glimpses of other women trying to gain access to the stadium by unconvincingly dressing as men. When our young woman is captured, she is tossed into a make-shift jail along with other similar young women. The focus here is on frustrated discussion between the young women and their jailors. The male guards are especially frustrated because they too are being prevented from seeing the game. This section features a very clever digression when one of the women needs to use the men’s room – there are no women’s rooms, obviously. She is forced to wear a poster depicting a soccer star over her face to disguise her identity and is asked to close her eyes while inside the men’s room because there may be graffiti inappropriate for a woman’s eyes. “Offside” draws parallels placing it in a universal context. The male-only access to everything from buses to sporting events to restrooms is reminiscent of Black History in America. There is even a story about a women-only soccer team with the male coach forced to lead the team by cell phone from the stadium parking lot. In a subtle touch, this connection is made clear by Panahi. The most politically motivated of the young women wears a baseball cap bearing the number 1862; the year Abraham Lincoln issued his Emancipation Proclamation freeing the slaves. Amazing review with strong and interesting points, thank you very much! Hey - I am certainly happy to discover this. great job!